Barrick Gold Corp. (NYSE:ABX) is the largest pure gold mining company in the world, so you would think no one is more in tune with the price of the precious metal than they are. Well, they have gotten caught with some bad hedges that were intended to provided the company with downside protection. Meanwhile, the price of gold has climbed to above $1000 as the dollar losses strength. This has obviously hurt profitability as the firm is not getting the full benefit from the rise in gold, and Barrick management has said that it will have to take a $5.6 billion charge on earnings from buying off these contracts. Now, the company is conducting a secondary offering in order to raise capital in order to clear those hedges. Since the traders’ discussion on last night’s Fast Money, Barrick has taken the opportunity to increase the offering to $3.5 billion citing strong demand. Clearly, investors in Barrick have been displeased with the companies hedging of 9.5 million ounces of gold well below current market value, and now that ABX plans to buy out those hedges investors are flowing back in. The pressure from shareholders should not be a huge surprise; after all, if you are long ABX then you must be bullish on gold. It appears that management has caved to the wishes of their shareholders, possibly an expensive proposition. Of course, there are two ways to interpret this secondary offering. We know that Barrick is bullish on gold, and there are plenty of gold bugs to scoop up the 94.8 million shares. They are of the opinion that gold itself is a hedge against inflation and perhaps could benefit from a flight to safety if the market has a downturn. Also, with the unprecedented fiscal stimulus firing up the printing presses, they think time will be on their side. On the other hand, gold has had quite a run since the beginning of the year when deflation was the buzz-word. 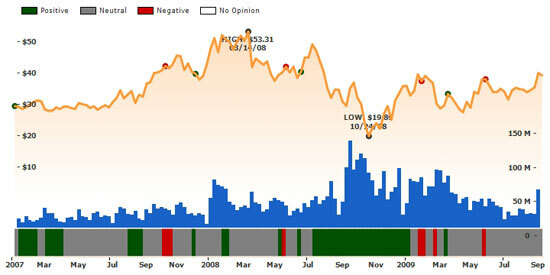 Gold has topped the highly psychological $1000 barrier a few times in recent years, but it has not stayed there long. Furthermore, with gold approaching all time highs the company would have saved a substantial amount of money by waiting for a pull back to make this move. We will be interested to see how this works out for ABX, but one thing we know in hindsight is that they hedged themselves at a far too low price. This put them between a rock and a hard spot and finally management bent to the demands of shareholders. This was not from a position of strength, and now the company has paid a very hefty price and is exposed to any pull back in gold prices. Of course, if the price of gold does not falter in the near term and continues its climb then they made a painful but wise decision. At Ockham, we have a Fairly Valued rating on ABX at the current price in the mid-$30’s. One thing we know for sure, ABX has levered themselves to the price of gold, possibly more to the downside than the up because of the cost of paying off their hedges.